Technical Car Experts Answers everything you need: Dometic Rooftop RV Air Conditioner, 630035 Heats instead of cooling? Dometic Rooftop RV Air Conditioner, 630035 Heats instead of cooling? Determine if the compressor is running. Do this by turning on the compressor and listening for noise and feeling for a vibration. If it doesn't run check to see if the thermostat is set correctly and make sure there isn't a blown circuit. Check the voltage with a voltmeter if the compressor is working. The voltage should be at least 13.4 volts. If the charge is below this it can cause the air conditioner to not cool. Clean the air filter with a soap and water mixture or vacuum the filter clean. For the unit to work properly it must have proper air flow. If the air filter is dirty the refrigerant will not be able to pick up enough heat from the air inside the RV. 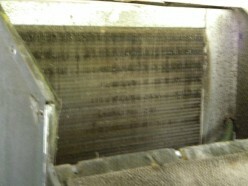 If the condenser coils are blocked, it won't be able to give off enough heat to the outside air as well. Clean the evaporator coils by blowing them clean with compressed air. Neglected and clogged evaporator coils can prevent the unit from cooling. Tape any rips in the duct work with duct tape. Any tears or holes will cause the unit to malfunction. Clear the registers of anything blocking them. Your motorhome AC system may have one or two units to help keep the camper cold, or warm if the RV AC units have optional heat elements. These repair and maintenance procedures are identical for all types of the aforementioned campers. After a few seasons of use, it isn’t unusual for the AC unit(s) to not cool the motorhome as quickly or as efficiently as it once did. Even though you have kept the filters clean on a regular basis, the evaporator and condenser coils will eventually become coated with dirt and grime which inhibits airflow and cooling efficiency. Before attempting any maintenance or repairs on the rooftop AC unit be sure to switch off the electrical supply to the unit, either by tripping the breaker or by unplugging the motorhome from the electrical receptacle. You are now ready to remove the RV AC shroud by unscrewing the four bolts securing it to the RV AC unit itself. After removing the AC shroud you will be able to see the evaporator and condenser coils on either end of the RV AC unit. If they appear similar to those in the photos below then they need a thorough cleaning. to allow unrestricted airflow through them. A good wet/dry Shop Vac will help to keep you from making a big mess during the cleaning regimen. much more efficiently and will not harm the coils themselves. Follow the instructions carefully for the best results and use the Shop-Vac to remove any excess cleaner or grime from the RV AC unit. Use a coil fin comb to straighten any bent fins because they too wull keep the airflow from moving through the AC coils. These fin combs are very inexpensive and may be used many times in the future on both RV and home AC coil fins. While the RV AC shroud is removed, it is a good time to service the fan motor and clean the fans themselves. it will have one fan motor which turns both the squirrel cage fan and the heat exhausting fan. This motor should be oiled at this time. If your RV AC fan motor has regular bearings in it there will be oiling ports at each end of the motor. It may be necessary to remove the top metal sheeting from over the fan motor to access the bearing oiling ports. A few sheet metal screw will have to be removed to allow you to add oil to the ports. If no oil ports are evident, then your rooftop AC unit has sleeves instead of bearings. 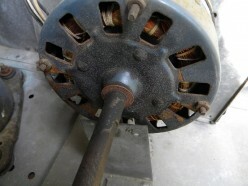 You may still oil the shaft at the point where the sleeves are contained in the fan motor housing. The oil will seep inside and help the fan motor last much longer. 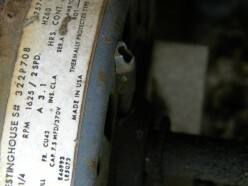 A fan motor with sleeves cannot be rebuilt economically, as can the bearing models, and must be replaced with a new one. If your AC fan motor is slow to start even after oiling, or needs a nudge to get it going, it will need rebuilding or replacement with a new one. As stated previously, a bearing model fan motor may be rebuilt fairly cheaply and will last for many more years. But not so a sleeved bearing AC fan motor. 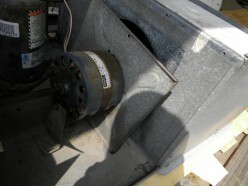 If your unit seems to be in pretty good shape a new AC fan motor may be ordered to fit your particular RV AC unit. Replacement of the AC fan motor is a simple job with only a few tools required for the project. Mark the wire colors before removing the fan motor if the connection isn’t a simple plug-in type electrical connection. Test the new RV AC fan motor before replacing the AC shroud to check for proper alignment and fan clearance. If the fan or compressor fails to start and the AC unit merely hums or trips a breaker, it is possible the starting capacitor is malfunctioning. The capacitor stores electricity to give both the fan motor and the compressor an extra boost when the RV AC unit first starts. It is not unusual for this item to go bad. The capacitor is easily replaced in the event it has gone bad. Note the wiring before removing the old AC capacitor and install the new capacitor in the same manner. Your AC unit should now start and run fine. Check the required voltage and model numbers on the new AC capacitor when ordering a new one. If, after determining the switches, capacitor, and relays are not at fault, the RV AC compressor fails to operate correctly it is usually better to just junk the unit and buy a new one. Unless you have access to a used compressor and have the means to replace it and recharge the system yourself, it will be too expensive to repair in most cases. Under normal circumstances the compressor will last much longer than the warranty covers. The thermostat and switches may be purchased online by finding the correct model and serial numbers before ordering the new parts. These items w\are very easily replaced in most cases. Pay attention to the wiring connections as always when replacing these electrical components.